MergeLane – the accelerator designed for companies with at least one woman in leadership – is in the homestretch of the application period. We want to give companies that have considered applying one more big push. Because we have learned that female entrepreneurs are their own best critics, we want you to try an experiment. Ask someone else. If your mom or your other biggest fan believes you meet our criteria, we want you to apply to MergeLane today…or by the December 15th deadline. MergeLane will be hosting eight stellar women-led companies for its first cohort beginning on February 2, 2015. 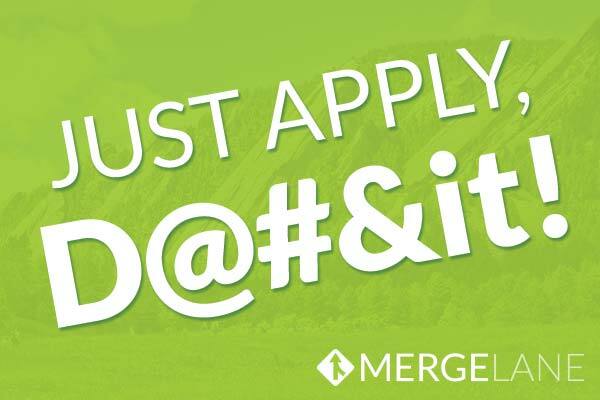 Founding teams are required to be in beautiful Boulder for two weeks in February and during our final week leading up to Demo Day on April 24, 2015. We want to be incredibly clear. Apply. Elizabeth addressed another question we’re hearing – ironically the opposite – in our last blog post, so I’ll address this one now. We adamantly reject this misgiving. Although we plan to honor our criteria, we want to encourage MergeLane candidate companies to take the risk of getting “ahead of their skis.” We want you to be uncomfortable. We want you to apply. We give you formal permission to submit an application that advances you, your team, and your business in the best possible light right now – or as of 11:59pm Mountain Time on December 15th. When I was in second grade, my dad started what was a lifetime (mine) push to get me to put my name forward for any elected position. I have no idea what offices I ran for in elementary school, but I recall running for all of them. If I lost an election for a vaunted slot as a lunch monitor, safety patrol, or captain of a kickball team, he’d pat my back and assure me that if I kept trying, I’d eventually get the nod of the electorate. In those early years, the future President of the Palmetto High School Debate Team (300+ hyper-verbal nerds strong) was born. Please. Put your company’s hat in this ring. We would love to connect with as many women-led companies and as many stellar entrepreneurs as we can discover through this process. Seriously. Really. Definitely. No excuses. Just apply now, dammit. Learn more about MergeLane and after you do that, click the eye-catching “apply now” button at www.MergeLane.com.